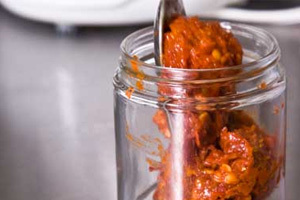 Use about 6oz of any combination of your favorite dried chili peppers. Choose any dried chilies, depending on the paste color that you want and the chili heat level. 1) Remove the stems and seeds from the chiles. 2) Pour boiling water over the chiles to cover and soak 30 minutes. Complete chili reconstituting instructions here. 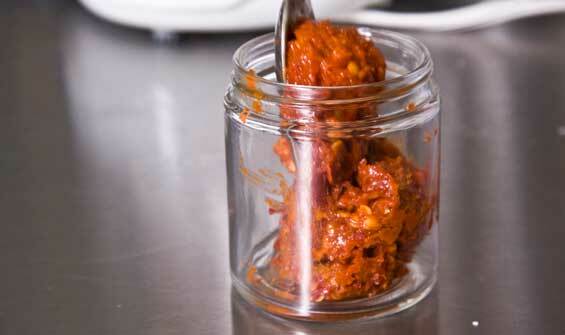 3) Drain the chiles and puree them thoroughly in a food mill or food processor fitted with a metal blade. 4) The paste can be stored, covered and refrigerated 10 days to 2 weeks; if covered with oil, it will keep in the refrigerator several months.